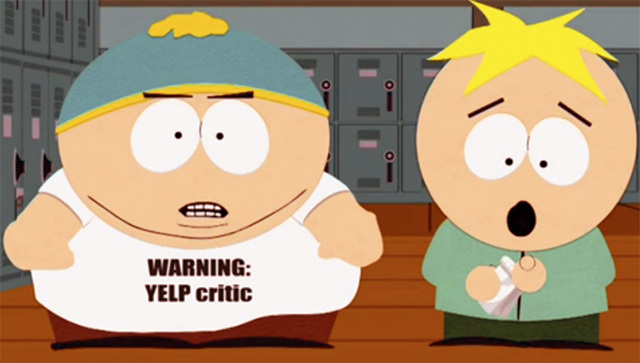 Then yesterday, I spot this hoax article on NBC.com.co named Yelp Sues South Park For $10 Million Over Latest Episode. It is so funny because you'd think a company like Yelp would actually do that. I am a die hard Yelper. I have also watched South Park since the first season. Love this story. Matt and Treys review of Yelp is classic. This episode is symbolic of SMB'S frustration with the current review system. I think if you (yelp) can't take humorous satire and laugh it off, then you might want to take a closer look at your business. Just because you say "our critics don't do that" doesn't mean it's not happening. They're digging a deeper hole for themselves now, rather than spinning it into a positive. It's hilarious IMO and illustrates how many business owners and their employees feel about some of the more arrogant Yelpers. I love using Yelp as a search engine. I travel often and find yelp reviews to be the most informative and resourceful. I learned a long time ago to "slow my roll" when writing my reviews. To be considerate with my words becuase there are real people and businesses on the other side.